You own a budding business, having your own shop where you sell your products. But you know you can do more by selling your goods online. So what do you do? You build your own website, where your customers can view your products and make purchases. Well, building a website is relatively easy making it viewable on the Internet is another matter. Hosting services is a service that enables individuals and organizations of all types to post a website or a web page on the World Wide Web. It offers a variety of technologies and services, which are necessary for posting websites onto the Internet. They likewise allow website owners to lease or purchase space in their servers in which to store their websites. These servers in turn feed the web pages online. Most hosting services require their customers to have their own domains but if you do not have one, they will help you purchase a one. 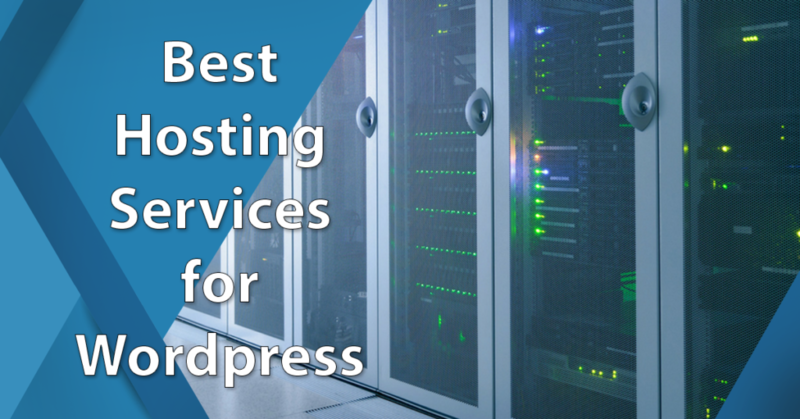 What are the 20 best web hosting for wordpress or blog? Now that you have your own website, you would need to come up with content that would suit your business and ideally raise your sales. There are a lot of content management systems (CMS) around but WordPress remains as the most widely used CMS. However, it is not your average CMS. WordPress for personal blog comes with an extensive library of themes and plugins, making it the foundation of many websites around the world, which include both personal and business pages. So if you’re interested in creating your own WordPress website, you should consider using a WP web host. A vast number of web host services provide a WP service in one form or another. Unlike traditional platforms, such web hosts come with WP pre-installed, doing away with the need to download and install the application. The web hosts, although differing in offerings, share functionalities such as page caching and automatic information back-ups. However, one should be on the lookout for are plug-ins that may already come with the setup, which could adversely impact the performance of a website. There are two types of hosts for Wordpress website, the managed and optimize types. Managed types are popular for offering excellent customer support and services such as site-staging for posts and pages, which need testing first before being posted on the web. Malware detection and removal are also key services, along with upgraded security. So why is choosing the right WP web host important to your enterprise? First, it is no secret that web hosting is an important part of a website’s success. It is also known to greatly enhance sales by enhancing your SEO. This upward trend in the demand for excellent sites has led to the growth of the website hosting service market. In fact, the global market for web hosting services is forecast to grow to $143.8 billion by 2020. Increased focus on the reduction of costs associated with website ownership and the need to hedge web technology and infrastructure’s hidden costs are seen to drive this growth. A provider of domain and website services, InMotion Hosting also offers hosting tools to different businesses. It provides services such as shared hosting, VPS hosting and dedicated servers. A highly-regarded service, InMotion caters primarily to small and medium-size organizations, providing them with fast and inexpensive web hosting solutions and excellent customer support. Extensively tested across four different sites, the service has been found to have an uptime of 99.895%, ensuring website speed. For good measure, InMotion has collaborated with popular Internet Service Providers around the world to create peering exchanges towards creating direct data connection. Other features include one-click installation for different scripts and applications for account management, website creation and eCommerce. It likewise supports PHP and MySQL software. The service is available at flexible pricing models starting at $5.99/month. The vendor also offers a 30-day money-back guarantee to unsatisfied clients. Hostwinds is a web-hosting company that delivers enterprise-level features and service at affordable price points. Hostwinds boast of a robust customer support team making it ideal for bloggers and business owners that are new to web hosting and are just testing the waters. It guarantees 99.999% uptime to its users. It even has a 60-day money back guarantee where users can have a full refund of their money if they’re not satisfied with the service that they received — no explanations needed. Hostwinds offer five service packages to its users for shared hosting, business hosting, Linux VPS, Windows VPS, and a dedicated server. In addition, Hostwinds can also customize a service package that suits your particular business needs. It’s ideal for bloggers and business owners for apart from web hosting, it can also provide SSL certificates, VPN, enterprise email, and domain services. It can very well be considered as a one-stop shop for uncomplicated users who just want matters done in one full go to get the business going. You can sign up for Hostwinds here. Hostwind plans are packaged depending on the nature of use. It offers its service and tools for as low as $3.29/month. First on our best web hosting for Wordpress list is popular web hosting service HostGator. It is known for its flexible prices and functionalities that cater to advanced Webmasters. It also offers excellent shared and virtual private server Web hosting packages. However, what sets the service apart is its dedicated hosting services. Security is tight, with the vendor providing power back-ups, fire detection and constant monitoring of its 12,000 servers, making sure that your website is safe and secure at all times. HostGlator utilizes 10 different fiber providers, along with hardware from prestigious firms like Time Warner and AT&T. It offers a 99% uptime guarantee and an RSS feed for service status. The service is available in three pricing models–a Hatchling Plan which goes for $4.86, a Baby Plan for $6.96 and a Business Plan which costs $10.46. For those who want to give HostGator a try first, a 45-day money-back guarantee is also in the offing. The vendor likewise offers excellent customer support, which comes in the form of a 24/7 phone support and Web chat. Known for its low priced shared hosting plans, plus VPS, dedicated and reseller options and domain registrations, web hosting service Bluehost boasts its own fiber connections, data centers, and custom Linux kernel. The service is ideal for PHP apps requiring lightweight CMS installations such as WP, Joomla and Drupal. Bluehost’s data centers feature power backups supplied by diesel generators and UPS, with servers monitoring conducted 24/7. All accounts are automatically backed up on a regular basis, assuring clients that their websites are safe and sound. The provider’s web hosting packages are on shared servers, with prices based on contract length. The service offers unlimited disk storage, secure email support, add-on, parked and subdomains. It showcases eCommerce features such as shopping carts, generated certificates and password protected directories. To make things even better the company has also thrown in a free domain, free site builder, a one-click WP install and 24/7 support. Pricing is flexible with plans starting at $2.95/month. With BlueHost, you don’t have to gamble, the vendor offers a 30-day money back guarantee in case you are not satisfied with the service. InterServer is a known web hosting service because you get excellent functionalities at a low price, making it among the best web hosting for WordPress. It is so inexpensive that for its lowest pricing plan you can get unlimited storage, transfer, email and free SSL certificates, while being able to maintain up to 20 sites. With the service, you get one click installation for more than 100 scripts for WP, Cubecart, osCommerce, Prestashop and Magenta, among other platforms. The web host uses high performance SSD hard drives with capacities ranging from 30 GB to 240 GB, which are also 20 times faster than conventional SATA disk drives. What’s more is that its servers support multiple languages, employing the latest versions of PHP, MySQL, Perl, Python, and Ruby, among others. These servers can be customized to suit Linux-based apps, server software or OS component. Users can add and manage multiple virtual servers with ease all within the InterServer control panel. You can likewise scale your virtual server using a web-based control panel. All these functionalities and more can benefit your organization starting at $5/month. One of the most highly-used and rated web hosting service for WP, SiteGround provides exceptional in-house WP speed and security applications. This capability is aimed at making your website as fast and secure as can be. Key features such as automatic updates, WP caching, CDN, one-click staging and GIT version control are bound to make your site run smoothly at all times. What sets SiteGround apart is that it offers location-specific hosting. It has three data centers in the US, Europe and Asia. The service’s fast servers ensure uptimes of 99.9%. As security can never be taken for granted, the vendor offers security measures, which include anti-hacking monitoring, antispam applications and hotlink protection. A feature called Leech Protect helps safeguard site users’ passwords. Aside from these, the service offers a free domain, daily backup, unlimited traffic and emails, free setup and transfer and free CloudFlare CDN. SiteGround is available in a number of pricing plans starting at $3.95/month. The vendor offers no free trial but a 30-day money-back guarantee is available. A provider of web hosting, reseller hosting and VPS hosting services, HostSlayer is known for its provision of excellent customer support. The server’s custom server panel allows users to reinstall their operating system to any of the host’s supported operating systems. The service utilizes WHMCS software for billing and setting up a hosting account. With the service, any site owner can reboot, shutdown, boot and reinstall the VPS. The service guarantees a 100% uptime and a robust DDoS security, covering up to 250 Gbps. It offers strong firewall protection that can stop any DDoS threat without suffering lag. The service is popular among game servers as the service’s network is connected on a 1 Gbps port. Other notable features include the use of SSD storage arrays with Radi-10, one of the fastest and most efficient storage technology around. The service is available starting at $1.99/month. A free trial is available for those who want to evaluate the service first. A leading green energy web hosting service, GreenGeeks initially provided only web hosting services. It has since expanded to offer reseller, VPS and dedicated hosting to larger organizations. The company has become such a successful provider that it has started operating an acquisitions program, buying hosting companies who would like to leave the industry. The company assures customers of a 99.9% uptime guarantee, indicating such in its terms and conditions. However, in case such agreement is breached, the company does not indicate if it is willing to provide refunds. GreenGeeks prides itself in its data centers, which are equipped with Supermicro rack-mountable servers that has power-efficient Intel quad-core processors. These are constantly monitored and backed up nightly. The data center enjoys onsite security 24/7 and has a UPS system in case of power outages. The service is available in a variety of hosting plans, starting at $3.96/month. It does not offer a free trial, but your investment is assured as the vendor offers a money-back guarantee. Known for making web hosting an easy task, DreamHost offers businesses a custom dashboard, one-click automatic WP install, automatic WP updates, unlimited storage and bandwidth and free SSDs, allowing your website to run 200% faster. Proof of the service’s popularity is that it powers over 600,000 WP websites and blogs. Aside from these, the vendor does not charge any setup fee and even gives you a free domain. Other services such as cloud storage, affiliate program with cash rewards for referrals and a free domain name for new accounts can also be availed. As the service’s shared hosting is based on Debian Linux, it is basically aimed at budget users. Its VPS and dedicated hosting services likewise provide free hosting to nonprofit charitable groups in the US. In the event users suffer downtimes, the service provides a credit of a free day’s hosting for every hour of downtime. With DreamHost, your website is secure as the web host’s data center are equipped to survive fires and earthquakes, aside from having a three megawatt power supply back up. The service is available in a variety of pricing schemes starting at $8.95. If you want to give the service a try first, a money-back guarantee is also in the offing. WP Neuron provides secure and fast WP web hosting using Apache, Varnish and Nginx. The service features server updates, smart cache flushing and technologies like PHP7 and HTTP/2. Security is also a strength, with websites constantly scanned for malware and if any is found, will provide the user a free install. The service is able to stop brute force attacks on sites, along with blocking tools and bots that scan your website for weaknesses. The service’s servers have anti-malware scanners, which constantly run to detect any malware code. All of WP Neuron’s pricing plans come with enhanced security and free malware removal, ensuring data security for website owners. What makes it even better is you can migrate your website free of charge. WP Neuron is an inexpensive service as you can get it for only $3.75/month, a plan which comes with unlimited storage, traffic and data transfer. Rounding up our best web hosting for Wordpress, web host service GoDaddy has been deemed as the no. 1 domain name registrar in the world. Despite having a reputation for being a domain, email and shared hosting provider, the service also offers VPS and dedicated servers. It is highly-scalable, allowing users to make seamless upgrades as their businesses grow. The web host offers guaranteed uptimes of 99.9% so you need not worry about your website’s page loading speed. For control options, GoDaddy provides users with three choices–the cPanel and Plesk control panels and Root access for more technologically knowledgeable users. It also offers unlimited email accounts through its GoDaddy Workspace functionality. You can access all these using a GoDaddy login information, which you get to have upon signing up. Security is excellent as the service implements 24/7 monitoring of all its servers. For customer service, the vendor uses phone support, tickets and emails, which are also available at any time. The solution’s WP hosting service is available at a variety of pricing models, starting at $7.99/month. GoDaddy is risk-free, offering prospects a 45-day money-back guarantee. Site5 is a web hosting service specifically targeted at web designers and developers with servers in the US, South America, Europe and Asia. It is known to perform great in terms of speed and support. The service provides unlimited bandwidth and storage space, along with disaster recovery back up. What’s good about Site5 is that its advanced features, which are typically offered for higher-priced plans come with their lowest-priced shared options. The service likewise provides free website migrations, enabling owners to host their sites elsewhere. It offers excellent customer service in the form of live chat and a knowledge base. Site5 is available in three pricing schemes, a $6.95/month plan, a $10.95/month plan and a $13.95/month model. For those of you who want to try it out first, a free trial is also available. A web hosting services that provides basic hosting plans, VPS and dedicated plans, HostMonster has established itself as a key player in the web hosting business. The service guarantees 99.9% uptime as its data center is constantly monitored by capable technicians. Its data center is power outage proof, being equipped with a synchronized power system and a UPS back up. These safeguards ensure that the center will keep functioning at optimal levels during any outage. In case of accidental data loss, the service offers an automatic backup system which can help in such a situation. HostMonster provides instant provisioning in case you decide to shift to VPS hosting or dedicated servers. For security, the provider has a variety of features such as SSL, SSH Access, Hotlink Protection, Spam Assassin Protection and regular website backups. It likewise has advanced features like disk storage, domain hosting, site builder and transfer, databases and scripts and eCommerce and multimedia capabilities. HostMonster’s lowest price is pegged at $4.95/month. The plan includes a 50GB storage, unlimited bandwidth, single website support, 25 subdomains and five email accounts. The plan is risk-free as it comes with a 30-day money-back guarantee. A leading web hosting provider, iPage boasts of more than a million clients. The service offers flexible hosting services aimed at businesses, personal, social and non-profit sites, focusing on websites, email and online security. An environment-friendly company, iPage uses wind energy to power its servers, offsetting energy use by as much as 200%. The provider has two data centers in Boston, Massachusetts, containing thousands of servers and Petabytes of storage. It also has redundant routers that connect its servers over multiple providers using BGP. For $1.99/month, you can avail of a free drag and drop site builder, domain registration, email address and marketing tools, among others. A risk-free 30-day money-back guarantee is also in the offing. Fatcow is a popular web hosting service known for its focus on customers. The provider provides clients with a native site builder and the option of a WP blog. The service is ideal for newbies owing to its fun style of brand. Truly FatCow makes web hosting an easy undertaking. The provider offers 99.9% uptime, assuring clients that their sites will be up 24/7. Daily backups and security measures ensure that your website stays safe even when power outages occur. FatCow also prides in using green energy to power its servers. The service provides unlimited disk space and bandwidth, data transfer and mailboxes. It is the perfect web hosting service for individuals and small businesses. Moneywise, the service offers excellent value with pricing plans starting at $4.08/month. However for those who want the annual subscription plan, the vendor will reduce this rate by $1. There is no free trial but a money-back guarantee is available. A provider of web hosting, VPS and game servers, Limitless Hosting also offers reseller hosting and DDoS protection of up to 250 Gbps. Its game servers feature a control panel with different functionalities including auto-restart and backup, among others. The service does everything for your website, preinstalling and maintaining all the software needed on your server. The provider offers unlimited mailing disk space, IP tables firewall, SEO marketing tools and 99.9% uptime and much more. It also provides a one-click WordPress for personal blog installer, which can likewise be used to install Joomla, Drupa and many other applications. Using technologies such as SSD, PHP7, SSL and CDM, loading speeds that are 12x faster than those of conventional web hosts are achieved. Limitless Hosting comes in affordable pricing plans, ranging from $.50 to $10/month. As it is highly-scalable, you can opt to get only the plan that suits your requirements. VIP WordPress web hosting service WP Engine offers easy hosting using fast and powerful servers. WP Engine makes your website virtually unhackable as it provides automatic security updates, daily backups, single-click restore points and top-of-the-line security, to mention a few. The service is ideal for site owners who want to do away with the technical hassles of running a blog. Offering a content delivery network, the provider makes hosting even faster. WP Engine has nifty features for WP users which include instant creation of a copy of a site for testing, easily transferable installs, and an option to migrate to PHP 7. Customer service is quite excellent with support available 24/7. It comes in the form of live chat, phone support, tickets and email. A Customer Experience Operations team is also available to constantly improve customer experience. The service is available in three different pricing models–the Personal plan comes in at $14.50/month, the Professional plan for $49.50/month and the Business plan for $124.50/month. Cloud-based web hosting service HostFav offers two hosting options, Cloud VPS Linux LXC and Cloud VPS for Windows and Linux. Both services are aimed at providing multiple site hosting that is smooth, reliable and cost-effective. Being cloud-based, the service does not require site owners to invest in more hardware and assures site owners of unlimited capacity. The service uses multicore Intel Xeon processors and RAID disk storage for data redundancy, resulting in a highly-secure and industry grade network that offers 99.99% uptime. With HostFav, you can rest assured that your site is always up and running. The provider also offers WP hosting, Linux shared hosting, reseller hosting and Windows shared hosting, among many others. These hosting services have a variety of features such as a site builder, domain name, email support and web file manager, to name a few. Customer support is superb, coming in the form of live chat, support tickets, a 24/7 call center and email. HostFav comes in different pricing plans starting at $2.50/month. These plans include advertising offers from Google, Bing and other sites, which can greatly help your business grow. Web hosting provider A2 Hosting offers robust hosting services for any type of website. It does not discriminate when it comes to clients. Whether your own a personal blog, a developer site or a business website, A2 Hosting can provide you with your all your hosting needs. The service uses high-performance servers that facilitate loading speeds that are up to 20 times faster than the competition. The company likewise offers shared hosting, VPS hosting, reseller hosting, cloud hosting and dedicated servers. It is virtually a one-stop shop for all your hosting requirements. It comes with a plethora of development tools, which include analytics, blog, billing, CMS, CRM, among many others. A2 Hosting has excellent customer support with a team on standby 24/7 to aid you in your inquiries and concerns. The service is available in four pricing models starting at $3.92 for shared hosting. A Reseller Hosting plan comes at $13.19/month, a VPS Hosting is available for $5.00/month while a dedicated Hosting plan comes for $99.59/month. You also do not have to take any risk as A2 Hosting comes with an anytime money-back guarantee. Steadfast Bare Metal Dedicated Servers is a Chicago-based company known for their cloud and managed IT infrastructure services. Trusted by over 3,000 customers across the United States, they provide highly customized service at all stages of engagement to ensure the website performance that you expect from your servers. They even provide on-demand technical support to help you make the most out of your servers. The provider offers a premium hosting services that are designed to optimize the speed, performance, and security of your website, making it great for those who want to set up blogs. Like most of the leading providers, they also offer 99.99% uptime guarantee, but what sets it apart is that they offer robust OS patching options as well as a sophisticated network monitoring system. Lastly, they provide custom migration solutions for your convenience. The provider offers excellent support, which comes in the form of live chat, phone, and support tickets. Steadfast Bare Metal Dedicated Servers comes in different pricing schemes starting at $179.95/month.